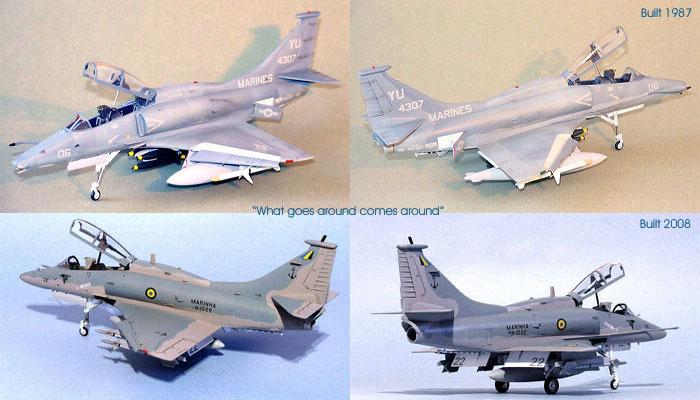 Here is Monogram's venerable 1/48 scale OA-4M Skyhawk built as a Brazilian AF-1A Skyhawk. There are probably a lot of such old Monogram stuff still lurking around in stashes and on flea market tables. I got this kit from a friend's collection. 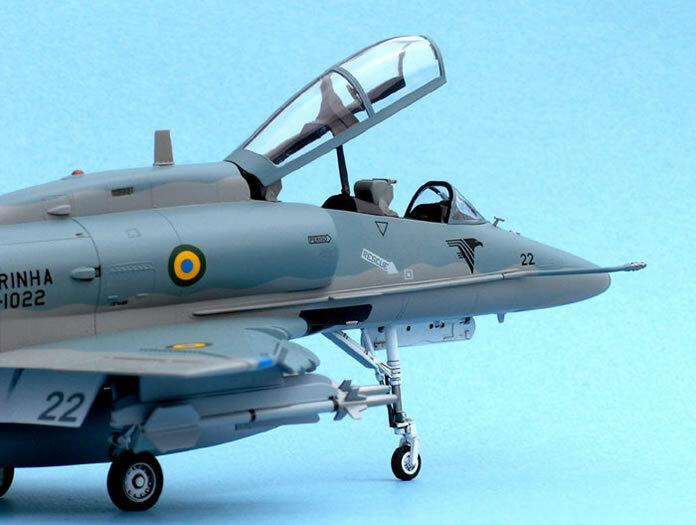 The decals are from the very nice sheet that comes with the HobbyCraft A-4M [Israeli]. 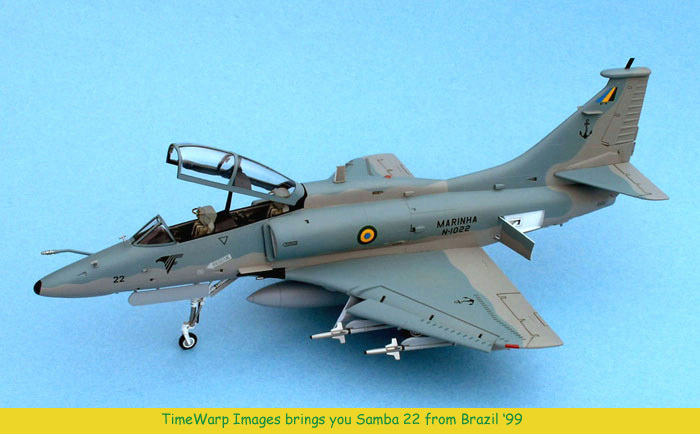 HobbyCraft was even kind enough to include code markings for N-1022, one of the three two-seaters in Brazilian Navy service. Pretty basic modeling done here! Most experienced modelers know the drill for the older Monogram kits - get things lined up as best you can, then work on seam elimination. Here there was the usual warpage, shrinkage and punch-out marks. But there was no re-scribing involved and I stuck to the basic 'homework'. 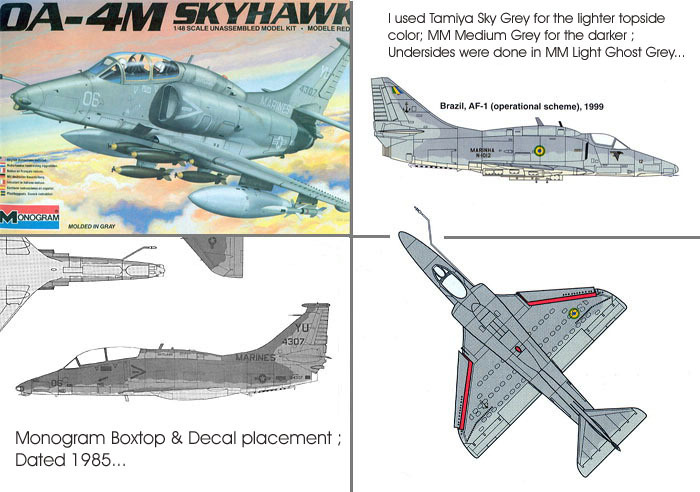 You can clearly see that the 3-tone grey scheme was done with [Tamiya] masking tape. As I lay down each color, I sealed it with a light coat of gloss (Testors 1261) to give the rather matt colors a bit more resiliency for masking. 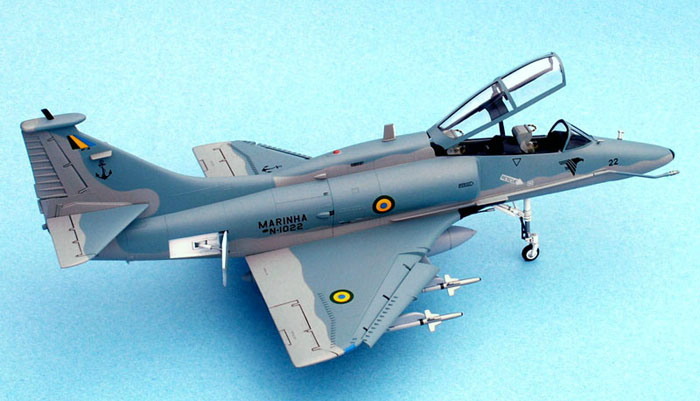 There is really nothing exceptonal or even notable about the model- everything went mostly as I expected. The project was one of those itches that you just have to scratch - all starting with those nice HobbyCraft decals. The probes, (dorsal) antenna, misseles and tank all came from the 'Skyhawk Scrapbox'. I appled a bit of dark acrylic wash to the control surface lines - but little or no weathering as I wanted that freshly painted look of service entry in 1999. 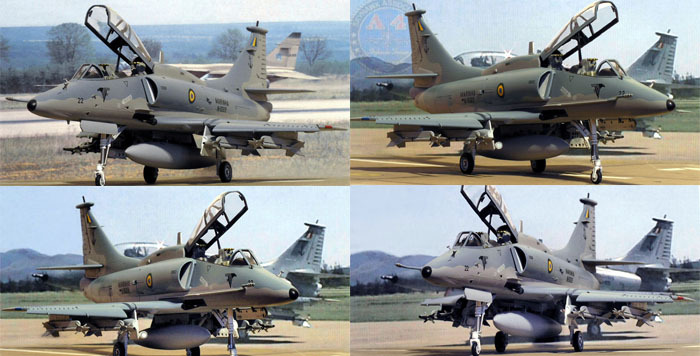 I've done some Photoshop work on the airfield ' Vignette ' shots to blend in the model, base and background - to 'tighten' the image and to try to balance the color. All the other shots are straight digital pics taken in (as you can see) various light conditions. None are fully satisfactory, but I bumbled on anyway.